Reno, NV - Sunday, July 10th was a wonderful day for the St. John Mission in Reno, NV. 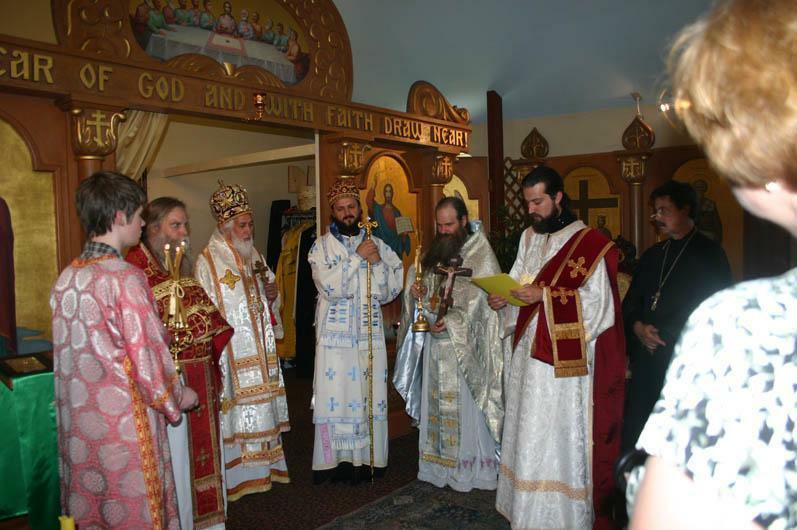 The Hierarchical Divine Liturgy was concelebrated in the chapel of St. Alexander of the Sleeping Ones by His Grace Bishop Maxim and His Grace Bishop Nikolai (from Las Vegas) at the thriving and enthusiastic mission Parish in Reno. They were assisted by the Parish Priest, Fr. James Barfield, Igumen Gerasim (Former Abbot of St. Herman Monastery), Protopresbyter William Weir (of Fair Oaks, CA), and Hierodeacon Panteleimon (a guest of the diocese). Fr. Hilarion Frakes (of the OCA) and Fr. Stephen Karcher (of the Greek Archdiocese) also participated in the day’s festivities. Vladika Maxim’s sermon celebrated the faith of a non-religious centurion and the love of Christ. His Grace noted that Christ marveled at the soldiers faith, but also spoke with him in terms he could understand. Following the Divine Liturgy an Episcopal Grammata was presented to Nikita Buick and his wife Nadine. This award recognized the significant contributions and support to the Orthodox Church of the Buick family. The chapel is owned and maintained by the Buicks and given to the mission parish with no financial burden. Following the Divine Liturgy, cutting of the Kolach and blessing of the Zhito, the people retired to the shady park-like atmosphere of the Church grounds. Everyone enjoyed a repast of freshly barbequed fish and a variety of side dishes. The youth of the Parish sang several songs and even enacted a musical story of Zacchaeus with the assistance of Papadija Nina. The Archpastoral visit concluded with a brief trip downtown to Forerunner Bookstore and its collection of icons, books, and other religious items.